City Palace & Museum: Representing their criss-crossing paths during war and peace, City Palace exhibits a beautiful marriage of Rajput and Mughal architecture. Although home to the royal family of Jaipur, most of the palace complex is open for public viewing. Built by Maharaja Jai Singh II, this is a large and opulent complex and comprises many elegant structures, beautiful gardens, spacious courtyards and even an astronomical observatory. Situated in the heart of the Old City, it is said that a secret tunnel connects the palace to Nahargarh Fort. Stop by here and feel like a prince or princess for a day. Budget for the better part of a day to see it all. Top billing! 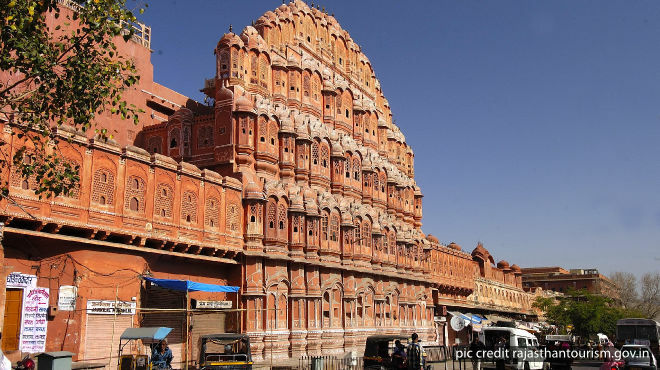 Hawa Mahal or Palace of the Winds is part of the City Palace complex. Built of red sandstone, five stories tall and picture-postcard perfect, Hawa Mahal is jaw-dropping. The reason it has a mind-boggling 950 windows is that this magnificent structure was an extension of the women’s quarters or Zenana chamber, and allowed the ladies to look down at the street without being seen. Remember, the Rajasthanis used to have a strong tradition of purdah that did not allow women to reveal their faces. Amer Fort: Situated 11 km from Jaipur city, Amer Fort dates back to 1592, when it was built by Raja Man Singh, master of all he surveyed from his throne high up in the Aravalli Hills. Back then, the ancient city of Amer was the seat of power of the Kucchwaha Rajputs, who rose to prominence in the early 11th century. Amer’s glory days came to an end in the 18th century, when Maharaja Jai Singh II shifted the capital to Jaipur. There’s a sound-and-light show at Amer Fort in the evening. Catch it and relish a slice of pure royal nostalgia. The son-et-lumiere is very well done and highly recommended. This beautiful fort is a must on every traveller’s itinerary. Jaigarh Fort: Built by Maharaja Jai Singh II in 1726, Jaigarh Fort is located not far from the city and was essentially a canon foundary fed by iron ore from the surrounding hills. This well-preserved fort is embraced by huge battlements and is connected to Amer Fort via underground passages. The piece de resistance here is a canon that was once the world’s largest canon-on-wheels. The fort offers a spectacular scenic view of the Aravalli Hills and Amer Fort. Nahargarh Fort: This is the third and smallest of the three forts that completed the defensive plan of Jaipur when the city was founded. Like Jaigarh Fort, this one too was commissioned by Maharaja Jai Singh II, in 1734. This fortress is not battle-scarred but important treaties with the Marathas were signed on the premises. Nahargarh Fort also offered refuge to the British Resident’s wife and other important Europeans during the Indian Mutiny of 1857. At the foothills of Nahargarh Fort is Gatore Ki Chattriyan, a cremation site for Jaipur royalty. Not frequented by many visitors, it is worth stopping by for its beautiful chhatris or cenotaphs. The cenotaph of Jai Singh II is made of marble and boasts a dome with 20 carved pillars. Jal Mahal: Just 6 km north of Jaipur en route to Amer Fort is one of the most exquisite gems of the Kucchwaha Rajputs – Jal Mahal or Water Palace – plum in the middle of Man Sagar Lake. With the gentle peaks of the Aravalli Hills on three sides and a view of Nahargarh Fort atop one of them, this palace is a jewel in the royal crown. But here’s the thing – as beautiful as it is, Jal Mahal is not really a palace. It’s merely a façade that was built so that the Maharajas of Jaipur could go bird hunting! There are five nesting islands in the middle of the lake, which once attracted resident and exotic migratory birds. When the lake fell to ruin, the birds all but disappeared but a massive restoration project, which began in the year 2000, has purified its waters and reintroduced fish into the lake. The nesting islands were also renovated as was the palace itself. The good news is the birds are reappearing. The great news for tourists is that traditional, Rajput-style wooden boats made by craftsmen from Vrindavan will row you from the shore to the palace. A tranquil island paradise. Don’t miss it! Tonk: A hidden jewel of Rajasthan for its low profile, Tonk is an awesome find you won’t see on many travel itineraries. So if fellow travellers look confused at the mention of ‘Tonk’, you can tell them you’ve seen magnificent mansions, mosques and colonial structures, and ancient Persian and Arabic manuscripts adorned in gold, emerald, pearls and rubies, almost in the middle of nowhere. Nestling on the banks of the Banas River, Tonk is a cross between Rajput and Mughal architecture due to its adventurous past. Alternatively in the possession of the Rajputs and Nawabs, it finally fell into the possession of the latter in 1798. Its founder Nawab Amir Khan was a patron of literature, which explains the manuscripts, now housed at the Arabic-Persian Research Institute in Tonk. The Sunehri Kothi is the star attraction of the town, a mansion polished in gold and boasting mirrors, stucco and stained glass interiors. Due to its fabulous Mughal architecture, Tonk is often called the Lucknow of Rajasthan. Definitely go! Shekhawati: A must visit for its fabulous Painted Havelis. Elephant Festival: Every year, on the day preceding the festival of Holi, the Jaipur Polo Ground opposite Sawai Mansingh Stadium explodes in a colourful and an unusual event. It’s the Elephant Festival, a signature festival of Jaipur, where tuskers are elaborately dressed in embroidered velvets, rugs, head plates, studded gold and silver jewellery and painted for the parade of royal parades. It’s a grand day for the mahouts or elephant owners too. They dress in royal brocades and turbans and mount their animals during the grand event. The procession, which includes horses, camels and palanquins, is followed by an elephant race, a tug-of-war between tusker and humans, and an elephant polo match. After the hubbub, the evening plays out to the strains of traditional folk music and dance and is thoroughly enjoyed by tourists, some of whom plan their itineraries around the event. Organised in February-March for only a day, the event is hosted by the Rajasthan Tourism Department. Don’t miss it! Shopping: Jaipur is a shopper’s paradise and you can find some of the finest jewellery studded with precious and semi-precious stones in this city. Lacquered brass and carved brass items also entice as does Jaipur enamel or Minakari work. The city’s bazaars also sell a mind-boggling variety of textiles, especially patterned in block prints and bandhni or tie-and-dye. Leather is another big industry. Rather than head for large showrooms and emporia – boring! – trawl the local bazaars but remember to bargain really hard. If you want to give it a go, visit Johari Bazar, Bapu Bazar, Nehru Bazar, Chaura Rasta, Tripolia Bazar and M I Road. If you have the time, dive deep into the alleys of Johari Bazaar and you can watch artisans polishing and cutting jewellery. How precious is that!